It seems that titanium nonstick cookware is one of the variety of marketing traps that lure the consumer into emptying their pockets for something they don’t really need, or at best, paying a higher amount that they really should have. “If people would stop buying things they don’t need, with money they don’t have, then we’d all be screwed”. I don’t remember who said this, but I think we all found that the current economic crisis is a sad proof of the truth of these words. And there is even a deeper meaning of this, a terrible and inherent flaw of the market mechanism that hasn’t been addressed yet, which I suspect is highly responsible for the current downturn trend of the global economy. You see, when the first Blade movie) came out, we all saw Wesley Snipes wielding an "acid etched titanium sword", a cool fantasy device that would not really work off screen, as a titanium blade would loose its sharpness very quickly. Yet, very soon, several major cutlery produces began marketing titanium knives, embellishing titanium properties and, of course, demanding higher than average prices for their merchandise, based on these properties. In fact, titanium and titanium alloys really have no practical place for knives, unless you really need the acid resistance for cutting those sulfuric acid infused tomatoes all day long. And now we return to the matter at hand, titanium nonstick cookware. There is an ongoing controversy in the cookware market regarding the nonstick appliances as several recent studies pointed out that the polymer composite coating that were traditionally used for the nonstick properties allegedly release compounds that can potentially be harmful when ingested. I have no doubt that all the major producers ensue all the testing necessary to make sure that the products they market are completely safe and do not generate harmful effects in their interaction with the final purchaser. This being especially true for companies involved in sensitive areas such as health, beauty care, or cooking. But no laboratory and field testing has the capacity of simulating every possible situation that is likely to happen when a product is put to real use, in millions of homes that create a indefinite variety of environment and stress factors. So, it is very likely that in certain conditions, some products may indeed potentially release those toxic compounds as the studies suggested. Titanium nonstick cookware is usually presented as an alternative to traditional nonstick cookware, suggesting that non stick capabilities would be related to titanium intrinsic properties, rather than to a added composite layer (such as the initial Teflon) made from chemical elements that may change their initial structure with prolonged use in certain stress conditions (heat, repeated rinses). Unfortunately, this is not true. Though titanium has many properties that make it the extraordinary metal it really is, being able to maintain a nonstick surface, by itself is not among them. Moreover, titanium is not especially good as a material for cooking utensils, not being able to readily conduct heat, which can cause some specific problems, such as hot-spots, for instance. Titanium’s only rational use in cookware is for backpacking cookware, where every ounce counts, and where titanium’s unmatched strength to weight ratio really shines. 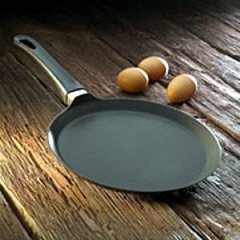 For the rest of us, that cook our eggs some other place than a secluded valley atop of a really high peak, at the end of the day the best omelet is cooked by your grandmother, whit her ol'iron pan, or whatever non-stick-non-titanium pan she used to have.